Comedian and talk show host Sherri Sheperd will star in a new Lifetime sitcom aptly called Sherri. The series will draw laughs from Sherri's real life. In fact, the pilot episode will put light on how her ex-husband and his illegit daughter move in with the actress. Twelve episodes have been ordered for the woman who said to the world that she believed, due to her Born Again convictions, the world was flat. And no, the comedian Sheperd was not joking. I'm not a regular View watcher, but occasionally I tune in to hear what's what in the minds of progressive and not-so-progressive women. 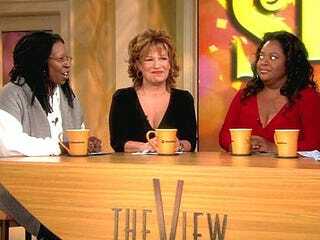 However, it's disappointing that Sherri never seems to bring the laughs on The View. With Beauty Shop and Guess Who in her canon, she seems forever trumped by Whoopi Goldberg and her somewhat conservative politics. I hope Sherry can bring some laughs to her "Born Again" life and not rely on dated male-bashing for ratings. Then again, much like Tyler Perry, she may already have a built-in audience.